in Yamato-e, the classical Japanese style, 12th century. 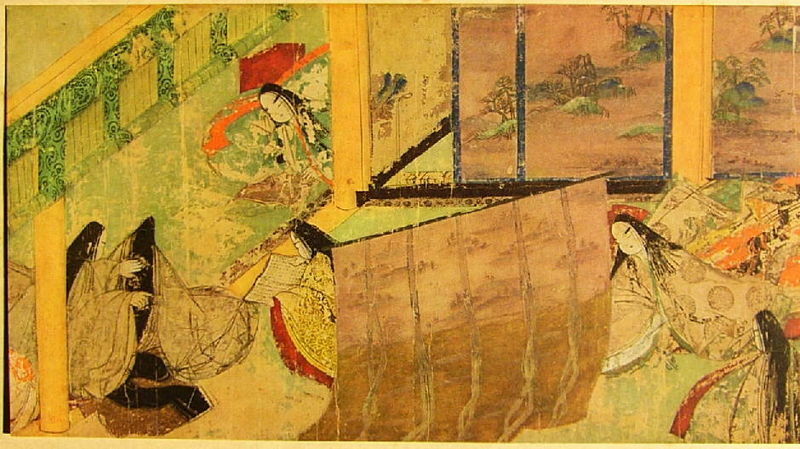 A thousand years ago, a Japanese woman wrote the world’s first novel. Tokugawa Art Museum, 12th Century. The Tale of Genji, written by Murakasi Shikibu, known in the West as Lady Murasaki, is thought to be an accurate description of aristocratic life in the Heian era of Japan (794 - 1185 CE). Little wonder since Muraskai was a lady-in-waiting at the imperial court in the 10th century. Raised by her father, a scholar and officer of the imperial court, she was given a male's education. 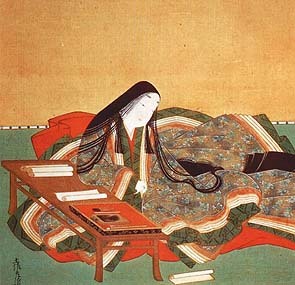 Three works are attributed to her – the Murasaki Shikibu Diary, the Murasaki Shikibu Collection (128 poems), and The Tale of Genji. Genji was written chapter by chapter in installments (54 in all), and delivered to the women of the aristocracy. There is one central character and a large number of major and minor characters. None of the characters have names, they are simply referred to by their functions, roles, relationships to others, or an honorific. It was considered inappropriate to use real names in the Heian court. There is no central plot in the novel, just the evolving story of the characters in time, but with amazing consistency. True to the writing of the time, Genji includes poems. It was customary and erudite to send poems, especially after a lovers’ tryst. Although there is no extant copy of the original manuscript, what does partially survive is a phenomenal piece that is a blend of both art and literature – the Genji Monogatari Emaki – believed to have been created between 1120 and 1130 CE. Monogatari is a literary form within traditional Japanese literature that is comparable to an epic. Closely related to oral tradition, it is usually about a fictional story, such as the Tale of Genji. While the form peaked during the 10th and 11th centuries, the word is still used for modern tales. The Lord of the Rings is known in Japan as the Yubiwa Monogatari. 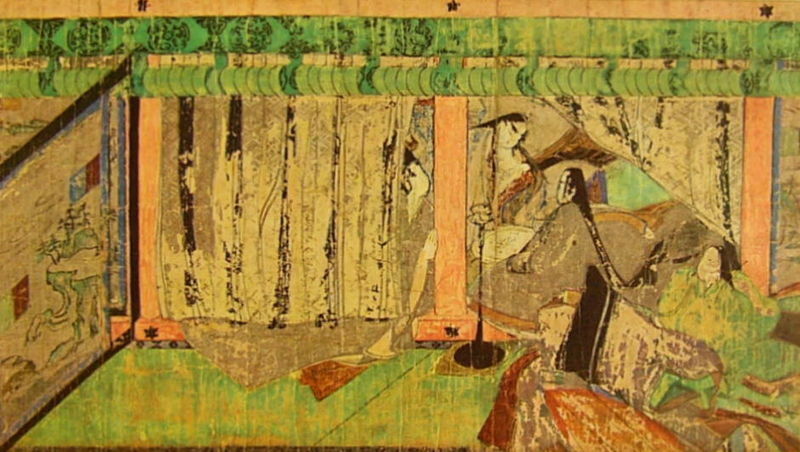 The Genji Monogatari Emaki (scroll) is both the oldest surviving scroll depicting the Tale of Genji, and the oldest surviving non-Buddhist scroll in Japan. Commissioned by rulers and members of the aristocracy, they were created by the best artists of their time. They were never intended for public view. There are other versions of the Genji Monogatari Emaki, but the one shown here is the most famous, and the term without other explanation refers to this one. The original scroll consisted of ten to twenty rolls, with over 100 paintings and 300 sheets of calligraphy, making it about 450 feet long. What survives of the Genji Monogatari Emaki is only 19 paintings, 65 sheets of calligraphy, and 9 pages of fragments, which is roughly 15 percent of the original scroll. There are two painting conventions from this era that were used in the Genji Monogatari Emaki. The first technique is funkinuki yatai, which means “blown away roof”. It is a compositional technique used to depict an architectural interior. A building is rendered without a roof so the gazer has a bird’s eye view of the interior. Genji Monogatari Emaki, Chapter 45, "Lady at the Bridge"
The second technique is hikime kagibana, literally “slit eyes, hooked nose”. This was used to illustrate people. Faces done in this style were always at an angle, with eyes in straight lines, noses in hooked lines, and with small mouths like circles. 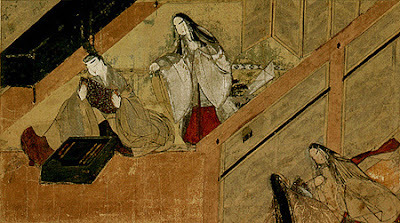 The faces in the Genji Monogatari Emaki notably have some variations, although later paintings using this style were less expressive. The calligraphers of the Genji Monogatari Emaki did not use just one style of calligraphy. The different styles were chosen for aesthetic purposes rather then for facile reading of the text. Because of this it is hard for even scholars to decipher. It is generally thought this was done so the focus would be on the paintings, and not the reading of the script. Japan has a National Treasure program whereby the most precious cultural properties are designated as such. The Genji Monogatari Emaki is one of these. These scrolls are so fragile that they are only shown in public on rare occasions, but reproductions and ephemera associated with them are available to the public eye. The Tokugawa Art Museum in Nagoya has some of the scrolls, as does the Gotoh Museum in Tokyo. An oversized photoreproduction, translated into English, was published in a limited edition in 1971 by Kodansha International. It is available from rare booksellers for around $400.00 -$450.00. The Tale of Genji has become a timeless classic, its popularity increasing throughout the centuries. It has been a key component of the Japanese education curricula for a millenium. Although it was not the only literature written during the Heian era, nor was Murasaki Shikibu the only writer, both were captivating enough to live on in the hearts and minds of people. The Genji Monogatari Emaki is a beautiful alliance of art and literature. Illustrations courtesy of the Tokugawa Art Museum and the Gotoh Museum. Hmmm....what could my spouse get me for my birthday...? !